Download Mortal Engines in Digital HD from the iTunes store. Listen to the Mortal Engines soundtrack on Apple Music. 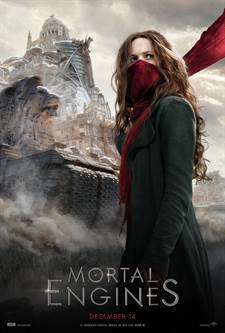 Mortal Engines images are © Universal Pictures. All Rights Reserved. Imagine what Earth would be like in a post-apocalyptic world. What if nuclear explosions hit multiple continents in a span of 60 minutes? What would be left? How would the world rebuild? What would that look like? Would it disintegrate into a dystopian society? Mortal Engines, the new film based on the Phillip Reeve novel of the same name, gives us a glimpse of what it would be like as humans struggle to survive with limited resources and lack of technology. The Steampunk-esque movie offers one view of what the future could look like 3000 years after humanity lost itself. Hester Shaw (Hera Hilmar; Anna Karenina) is an orphan and a drifter out for revenge. When she was eight years old her mother was murdered by the man who has become one of the leaders of the rolling city of London, Thaddeus Valentine (Hugo Weaving; The Lord of the Rings Trilogy). Over ten years later she has the chance to get close enough to him and carry out her plan but is thwarted when Tom Natsworthy (Robert Sheehan; Fortitude), a London citizen stops her. As he chases after Hester he learns that Valentine killed her mother but when he tells Valentine what Hester said Valentine turns on Tom too throwing him over a railing and off the moving city. Suddenly Hester and Tom find themselves wandering the outlands trying to figure out a way to survive. After a few close calls, they are rescued by a rebel named Anna Fang (Jihae; Mars) who knew Hester's mother and is hoping Hester holds the key to stop Valentine. Meanwhile, Hester is being pursued by a robotic killing machine, Shrike (Stephen Lang; Avatar) that raised her when he found her alone and injured in the Outlands. Eventually, while under attack, Hester realizes she literally has the key to stopping Valentine's attack. Once she does she finally gets what she wanted all along and watches Valentine die. Hilmar does a very good job playing the broken and guarded Hester. We feel her emotions as she seems to wear them on her sleeve and they show all over her face. Sheehan is a nice compliment to her as he too shows a range of emotion through various facial expressions. Weaving is always strong as the villain and this movie is no exception. You realize from the start that he is up to no good and he is evil down to his very soul and he delivers in that regard. Jihae literally kicks but in her first feature film role and manages a solid performance overall. If the steampunk aspect of Mortal Engines is one of the highlights ( and believe me, it is) then the script is one of the lower ones. It is cliched and boring without imaginative dialogue and because of this, the film drags. While the setting is somewhat unique the basic plot is old and tired with little originality. The special effects are also mediocre and since most of the movie is done with CGI there isn't a very genuine feel to it. With Peter Jackson (The Lord of the Rings Trilogy) Co-producing and Co-writing the screenplay I held out hope that the film would be better than the trailers but unfortunately, that isn't the case here. Mortal Engines is predictable and doesn't offer a lot in the way of extraordinary scenes. Also, as often happens with movies based on novels, there is an attempt to squeeze a lot of details into a short amount of time which can be distracting and mildly annoying. With a number of terrific movies hitting theaters in time for the holidays, this wasn't a great choice to add into the mix.